Part horse, part fish, part dragon, part saxophone — the seahorse is one of the weirdest-looking creatures you’ll find under the water. 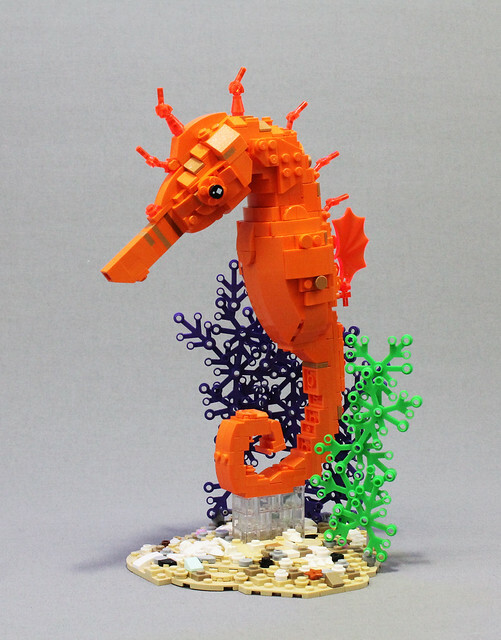 However this aquatic oddity’s peculiar appearance hasn’t put Brother Steven off creating a LEGO version, and the result is lovely. The orange works well, with restrained use of pearl gold and some exposed studs adding some welcome texture and scale-like details, and the spines along the back are excellent. The sandy base is nicely done — adding a coral reef context without distracting from the central model, but the overall shaping is the main attraction here. Don’t miss the use of minifigure legs to create the final curl of the seahorse’s tail — an inspired parts use.